I love using fresh herbs this time of year. We used to plant all different varieties in our garden. It was so difficult to just run out and snip what I needed and quickly head back inside. All of a sudden I am on a scavenger hunt for crocs, the sand box is open, little feet are stomping on the lettuce and I'm prying a screaming baby off the swings all because I needed 3 tablespoons of rosemary. I have also potted them on our deck for easy access but I found that took too much space. Thanks to Martha, I constructed a gi-normous tower of herbs that sits in the corner of the deck. It only takes the space of one large pot but holds eight different herbs. This makes snipping so much easier. Here is a really easy prep ahead dish that uses some of those great fresh herbs that you can grow or buy locally this time of year. You could substitute dried oregano (1/2 the amount) but use fresh rosemary if you can! 1. Combine oil, wine, herbs, garlic and lemon zest in a large roasting pan. 3. 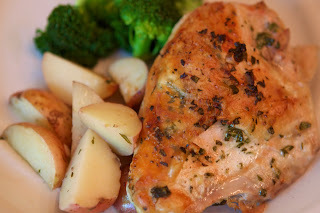 Using your hands, rub the olive oil/herb mixture all over the chicken. You need to put the mixture underneath the skin of the chicken breast. Peel it back and spread the mixture right on the chicken. This makes a huge difference in the flavor of the chicken! 4. Place the chicken skin side down in the pan. Cover it with foil and refrigerate overnight. 5. The next day, remove pan from fridge and scatter the red potatoes around the chicken making sure they are all well covered in the herb/oil mixture. 6. Bake the chicken uncovered at 375 degrees for 30 minutes. At this time, flip the chicken and give the potatoes a stir. Bake an additional 30 minutes. To crisp up the skin, turn the broiler on high for about 5 minutes or so. Prep Ahead: Making the herb/oil mixture and rubbing it on the chicken takes about 10-15 minutes the night before (and that includes clean up)! Copyright © PrepAhead and Dine In: crispy rosemary chicken and potatoes. All Rights Reserved.